Early in December on a still, serene San Diego morning, I boarded the Ohana. The three-plus-hour adventure that followed was exhilarating, to say the least. 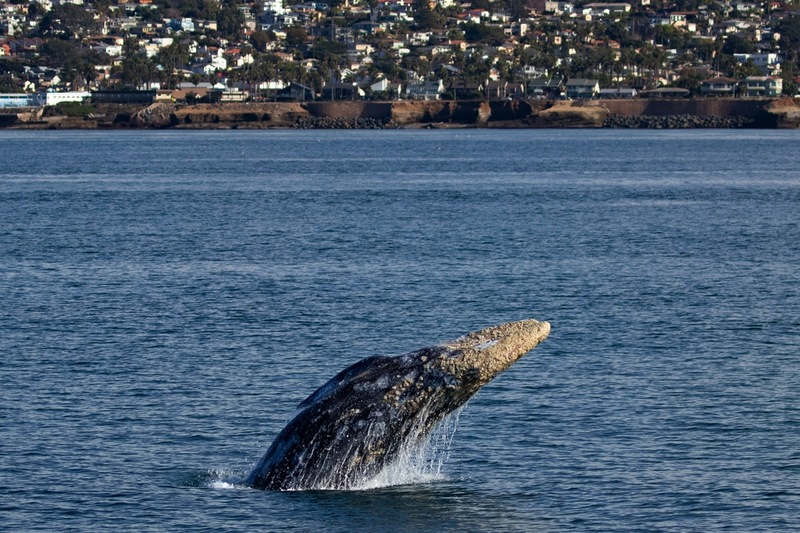 Although I am a native San Diegan, I had never been on a whale watching tour, but it has had a place at the top of my bucket list for quite some time. Dress warmly. You can always shed layers. Being cold on the ocean can be miserable. During the winter months, the temperature in combination with the offshore winds can become very chilly (think Jack and Rose from “Titanic”). Sunscreen is also recommended, even on overcast days. While an SLR camera with a zoom lens is ideal, there are on-board photographers who will share their images and upload on the SD Whale Watch blog following most trips. The double-decker Ohana is 65 feet from bow to stern and has a capacity of 128 persons. Although there is indoor seating with 360° views of Mission Bay and the Pacific, the deck is where all the action takes place. The galley is stocked with snacks, beer, wine, and even mimosas are available for purchase. If you are prone to sea-sickness, the crew recommends staying near the stern of the boat—it’s the most stable and flat location. Our tour began at Sea Forth Landing in Mission Beach. The first boat leaves the docks at 10 a.m. sharp with check-in a half hour prior to departure. You can either reserve your ticket online or pay at the desk prior to the trip. For the duration of the cruise, the knowledgeable and friendly staff makes passengers feel safe and comfortable. Naturalist Vanessa James gives an informational play-by-play throughout the trip and is readily available to answer any questions. In addition, Captain Cristin Kelly is a seasoned vet who expertly positions Ohana for any potential photo ops while being careful not to disturb the wildlife. The five other crew members are also very approachable and attentive. 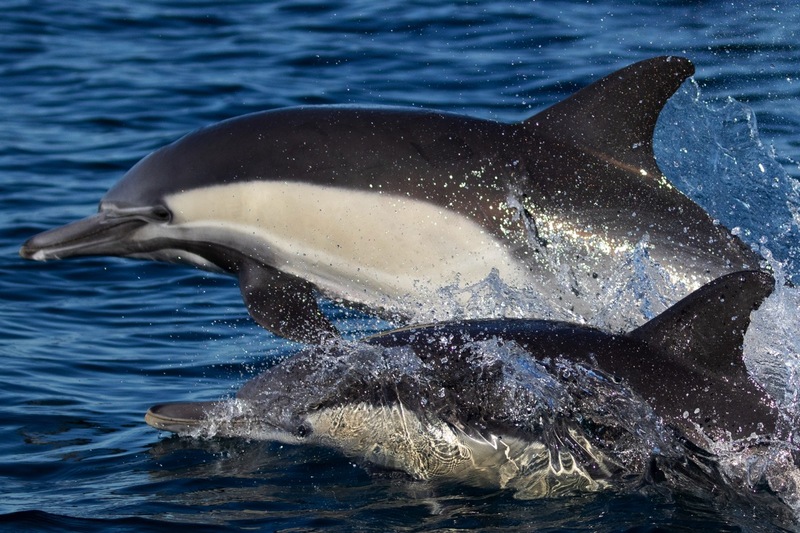 We first sighted a pod of 15 Pacific white-sided dolphins that were moving to the south. If that wasn’t exciting enough, another pod of over 75 common dolphins put on an awesome show and were even bow riding (surfing in the wake created by boats and ships)! Next, we set out to the deep-water shelf where oceans depths drop off from 100 feet to 600–700 feet. The sightings kept coming when we passed California sea lions, a couple of elusive harbor seals and a variety of pelagic seabirds. When we turned starboard back to the coast, the magic happened! A crewmember spotted spray from a blowhole in the distance. 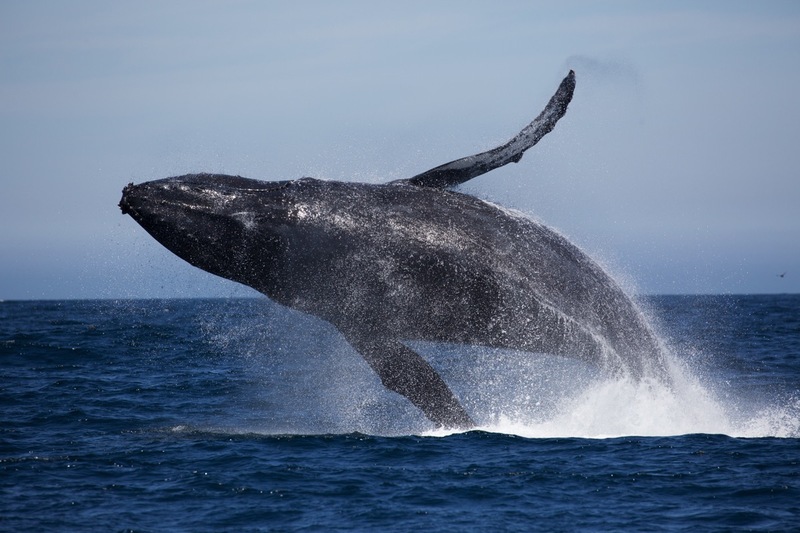 It belonged to a single juvenile gray whale traveling south on its annual migration! We observed it traveling at 5 mph, coming up for 3–5 breaths, and going down for three-minute dives. To top it off, it breached seven times, which is very rare for these often elusive, majestic creatures. The trip ran a little longer than the scheduled 180 minutes, but it was well worth it for the once-in-a-lifetime experience. 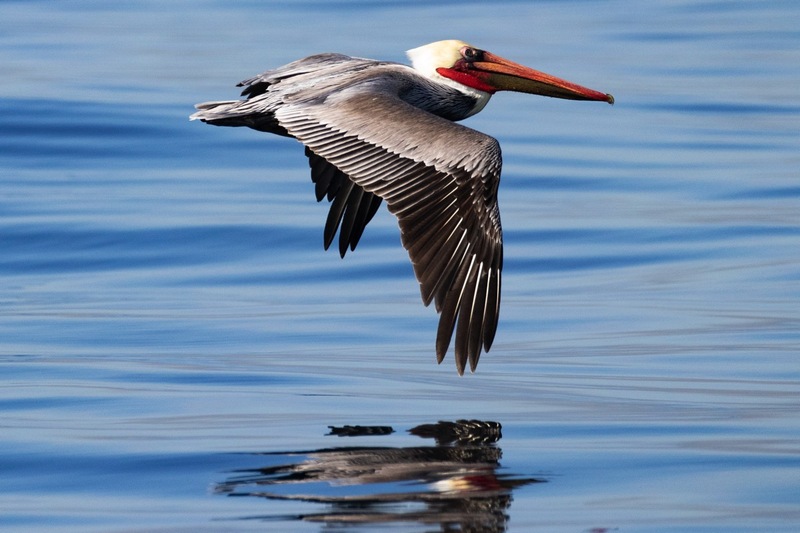 In addition to whale watching, the three-hour cruise is ideal for bird watchers or those simply wanting to see San Diego from another perspective. The view of the San Diego coastline is epic. 1,100 – the weight in pounds of a newborn gray whale—and they are 15 feet long!